Street Art is somewhat rare in these parts. Sure we have many murals, thanks in large part to the Los Angeles Mural Moritorium rarely being enforced around here. Yes, there is lots and lots of graffiti on every reachable surface in our corner of Los Angeles. Tags, toys, stickers, stencils, sometimes a random hanging bear or knitted installation, and there are plenty of impressive pieces along our alleyways. But Street Art, its not what we see much of around here. That is why about a year ago something beyond the daily stapled flyer, nailed yard sale sign or graffiti tag on the telephone pole caught my eye. Banded around a 1945 inspection stamp on the corner of Figueroa and Ave 52. 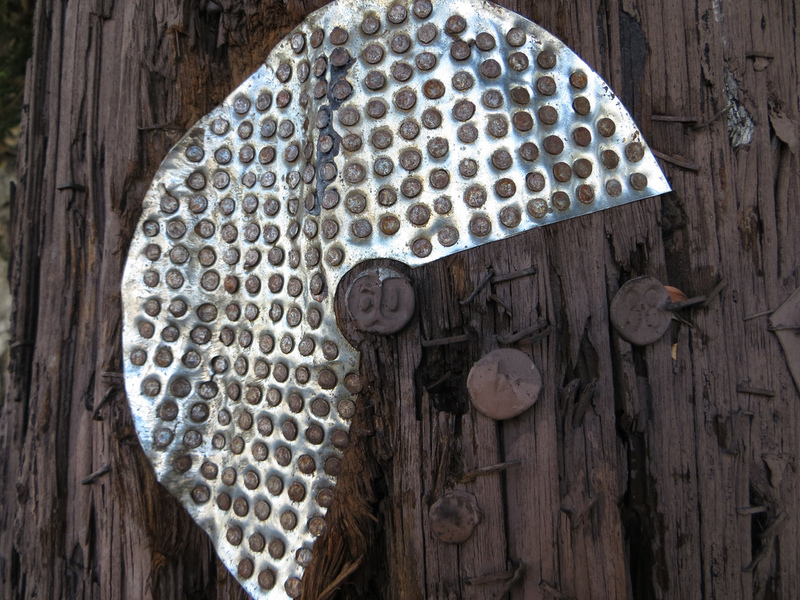 At first, I thought the nailed metal was just hardware placed by a utility company. But then, upon closer inspection, I realized it was something more, something artistic. 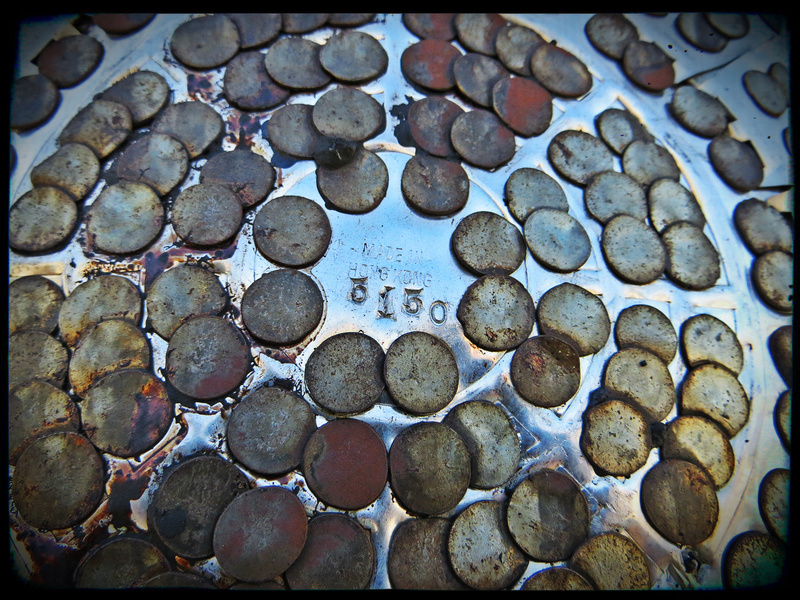 Metal medallion around a 1960 inspection stamp in front of Nightingale Middle School at Cypress Park Village on Figueroa. 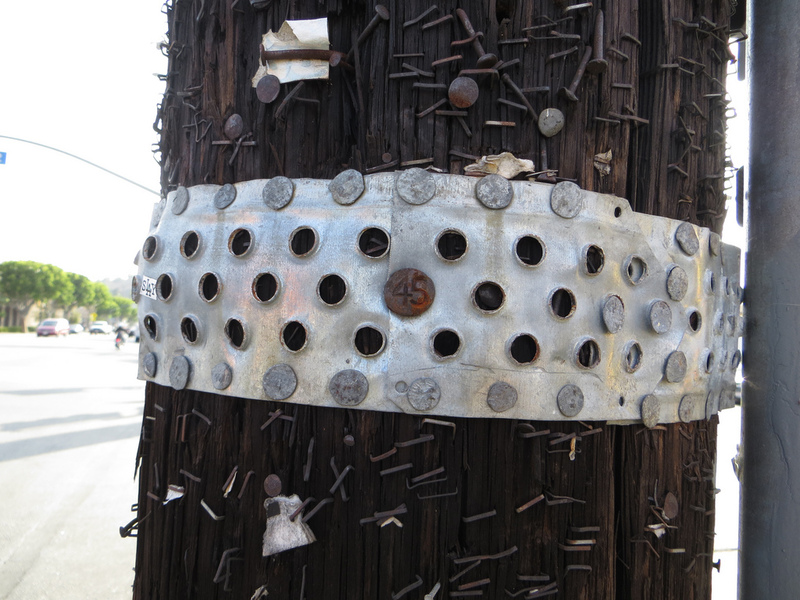 It was then that I started to notice the nailed metal pieces seemingly EVERYWHERE around Northeast Los Angeles. On Colorado Blvd at Townsend in Eagle Rock. Nail flower on Eagle Rock Blvd. 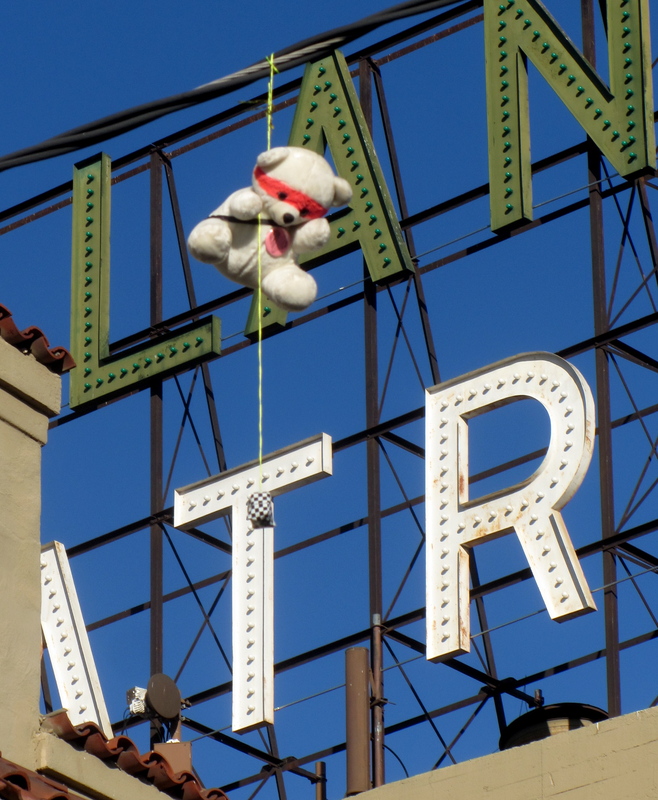 Crazy or not, the artist 5150 (Or as Amy Inouye reports in September’s NELA Art News, his name is either Blake, Blaine or Brent) has made traveling about Northeast Los Angeles a lot more interesting. Finding the art about town is a lot like coming across geocaches, often hidden in plain sight, they add value to the day’s monotony. 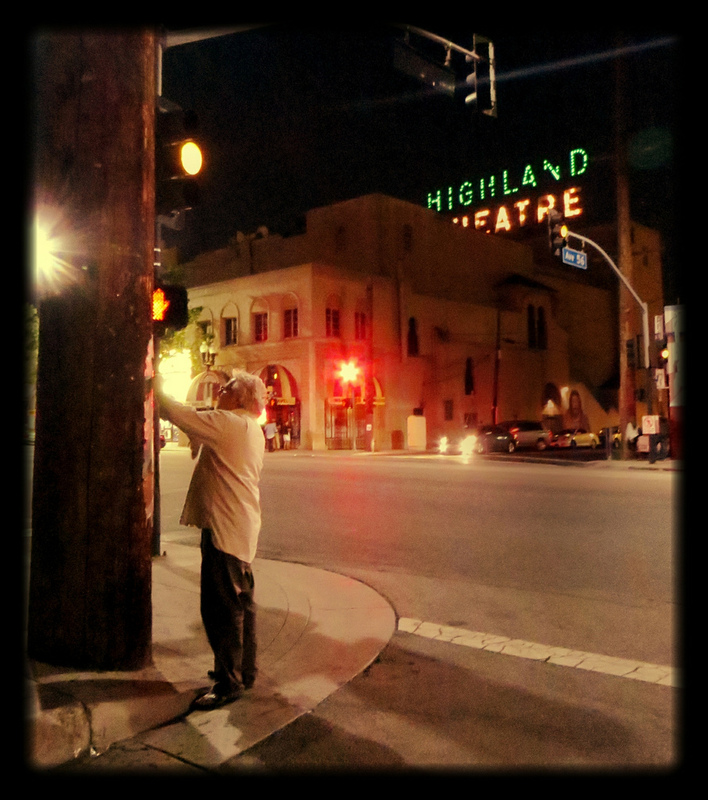 Outside Weinerschnitzel on Figueroa Street and Ellita Place. 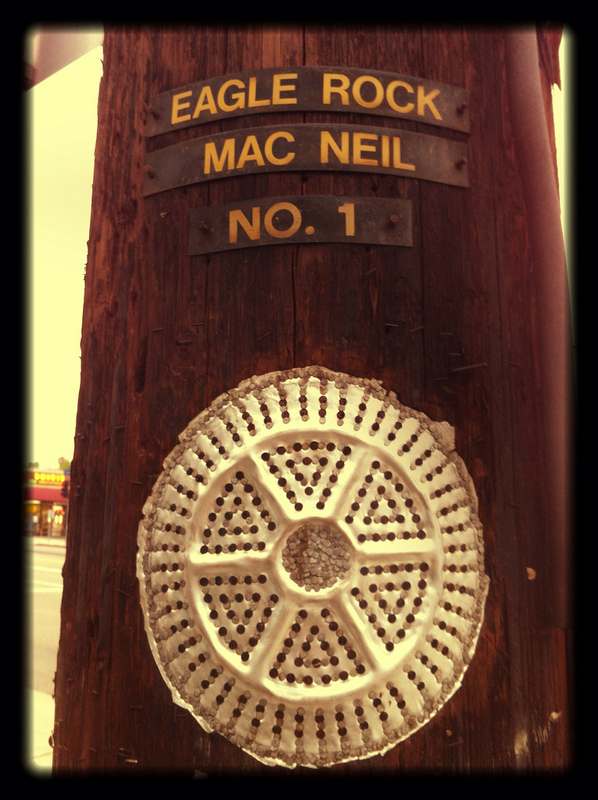 Corner of Eagle Rock Blvd and Avenue 42. Fashioned around an old Santa Fe railroad post imbedded between three palms on Figueroa Street. Found on Avenue 51 at York Blvd. 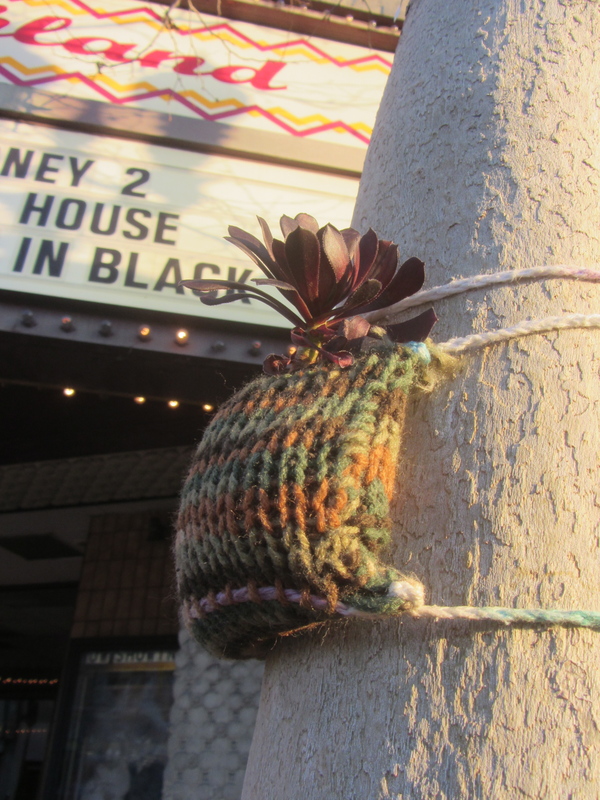 On Avenue 42 in Glassell Park. Outside Rivera’s Express on York and Ave 46. The pieces are usually just abstract scrap metal repurposed from Lockheed Martin aerospace parts or metal container lids nailed to telephone poles with an abundance of nails. Sometimes 5150 creates a star or flower pattern with his nails, but for the most part the shapes are non-representative. So far, I have come across 32 of the art pieces, and surely expect to find more. Especially when I hear that hammer in the night. The artist, “5150” hammering through the night. Hendrik Stooker used to talk about a local sensibility he enjoyed and referred to as ‘Highland Park Eccentric’. Stuff like the house near the Ave 57 Gold Line station with toy trains permanently installed on the porch roof, or the house on El Paso with the stucco leaves, and spider on the wall. Or Devon Glass’ giant roof lions. Or Chicken Boy. When I started to see the metal decorations, I thought of Hendrik. He would approve, and so do I.
Neat! Just another reminder to keep your peepers open in this city– so many hidden treasures. 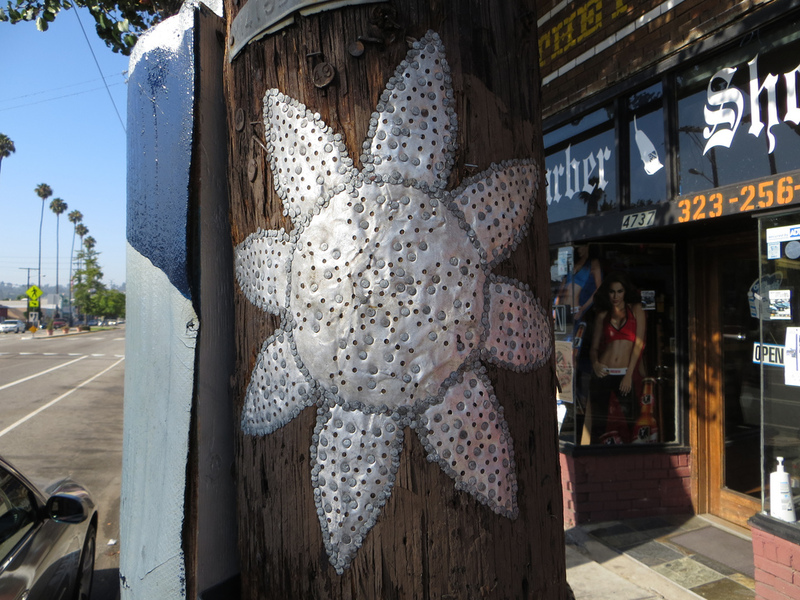 Hooray for LA, Street Art, and Making Something Out of Nothing!